This topic contains 11 replies, has 4 voices, and was last updated by Stephen Madjanovich 2 months, 1 week ago. 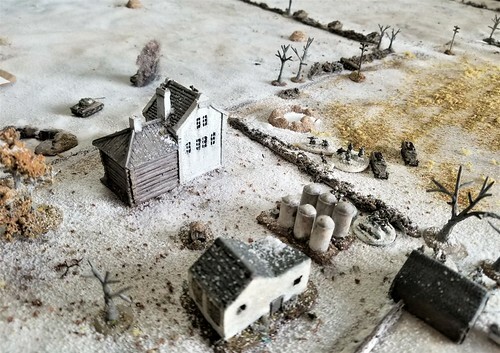 We played a East Front winter game using IABSM and my 6mm stuff last week. 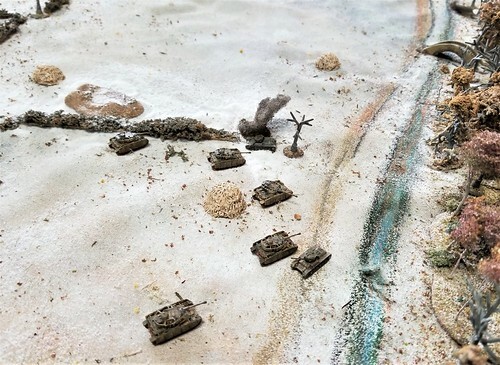 This action takes place, Jan 18, 1945 North of the Danube as a Kampfgruppe of the 20th Pz swings left to get behind the Soviet lines around Bucs. 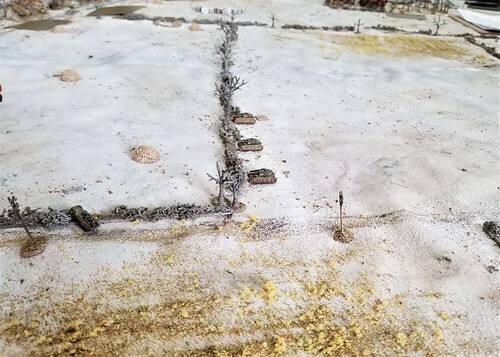 The Obitsky Canal was on the north edge of the table-the Soviet entry line. 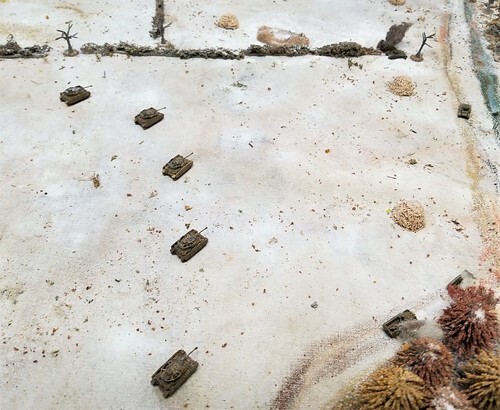 The Germans (William) would enter along the south edge with 8) PzIVH/Js and Sdkfz 251s mounted Pz grd 2) 4 section companies, 2) Stummels 2) MMG teams and a FO for a couple of 82mm mortars I put a Blitzkrieg and Rapid Deployment card in for them and they had a+2 Tank ace. The only way to get across the canal was via 2 bridges.The table is flat and cut by several hedges. A farm off to the right is unoccupied. 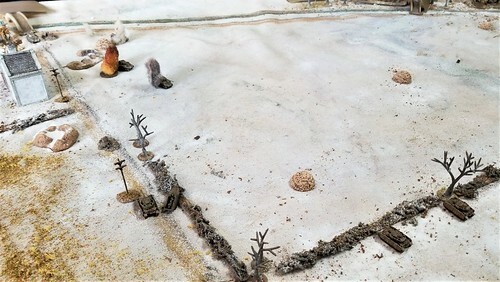 There are some defensive works facing east from the earlier actions in which the Russian forced the Axis defenders back. The Russians (Randy and myself) had the remain of the 30th Guards Mech Brig of the 9th Mech Corps. 6) M4A2s (76mm), 2) Valentine IXs, and 6 sections of Guards infantry, 2) MMG teams and 3) ATR teams. There was a FO for a section of medium mortars. And 4) SU76s from the 697th Self propelled Art Rgt were also available. We would start coming in as blinds on turn 2 from the north edge so we had to cross the canal. We also were low on AP ammo, so when a tank rolled doubles, we would only have one more turn of firing. The SUs had to roll doubles twice. This was to be unnecessary. Your games are always so beautiful and inspiring, Mark! I am happy you are posting them here! We get slapped around, but we have a good time! 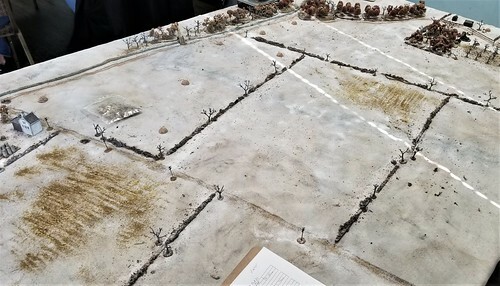 What did you use for the base sheet for this game? it looks excellent and I was wondering if it was a home made mat (details please) or a bought one. Thank you. He has an entire tutorial on the GHQ website. He should port it over here a service to the hobby! A link would be acceptable. It is an old bed sheet. I use chalk pastels for roads and highlights. Afterwards I throw it in the wash and most of it comes out. What doesn’t just get sprayed with the cheapest paint from a hardware store. 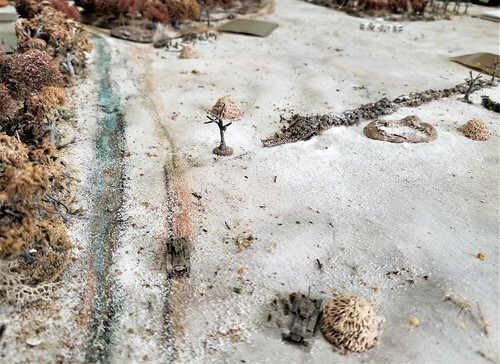 Link to a flickr set on setting up a table-Its a bocage gane but the same idea. I have a brown sheet and a green sheet in addition to the ‘white’ one. That’s a great idea to use pastels to mark our roads etc. Perfect for some Bloody Big Battles games. Sorry if I sound slow but. Basically you use home made painted drop sheets. 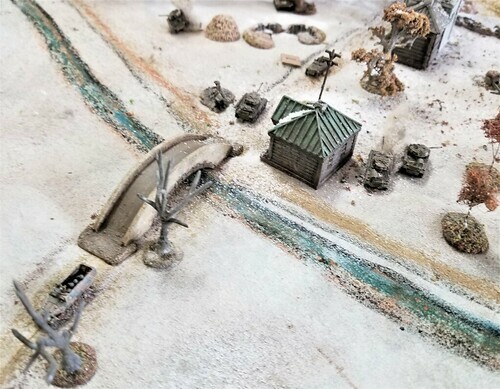 For each scenario you use chalk based pastels and mark in any temporary terrain such as roads, field boundaries and water. Then after the game you wash the sheets removing most of the chalk. Any which remains is over painted again before the next use. Great idea. At the first Hot Lead I attended in Stratford one of the guys did something similar but he created roads (dirt I believe) from (coloured?) sand heavily sprinkled (in lines not broadly) on the sheet. After the game he “picked up” by using a small vacuum (like a car vacuum) to pick up the sand which he saved and re-used. I have an old green drop sheet which is sprayed with irregular patches, lines, etc. of contrasting paint. One side is covered in black iron on hexes, the other side white ones. I use 2″ for my armour games. I like the idea of the pastels, have to make sure they are not oil pastels of course, and may steal the idea. I need to make up some desert sheets and have an old unused canvas paint drop cloth for a basis. Thank you. Obviously, my version wasn’t as nice as his, but I can confirm that it is easy and I feel that with more practice I could do a good job! Its not as highly detailed as making terrain boards but much more versatile and storage is a heck of a lot easier. And not too expensive. I’ve had these 3 sheets for a decade or more now. The do get tears but I just patch them on the underside. Odds are that there will some terrain over the ripped spot at any rate. I am very between systems on how to work my terrain. 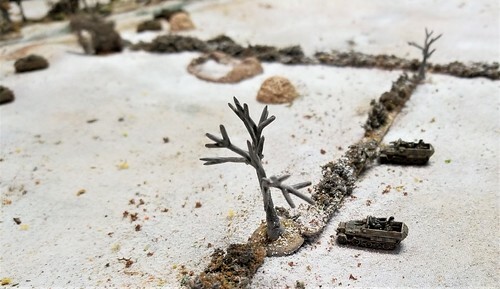 I like the IDEA of terrain boards but am put off by storage and the thought that there will only be so many variations on a theme. Now ASL and Conflict of Heroes (games I am familiar with I know there are others) who use fixed boards and there seems no limit despite the limited variety there. So if using fixed boards the start would seem to be a variety of smaller boards and scenarios are made of two to four boards dependent on individual size. I have a sheet from back in the day which already has hexes printed on it. I personally like hexes and find the limitations are far out weighted by the benefits. With these all terrain must be laced during set up which increases set up and take down time but maximizes flexibility. So the “ideal” solution is for the gamer to decide. Please chime in with other ideas or pros or cons, thank you.